The cruise port at Victoria, capital city of British Columbia, sits on the southern tip of Vancouver Island. Victoria is a busy port for cruises to Alaska, Hawaii and points south. Up to four ships at a time berth at Ogden Point, which is close to downtown and Inner Harbour attractions. Passenger services at the docks include gift shops, foreign currency exchange and pay phones. Tour and shuttle buses, taxis and other forms of transportation also are available. Four attractions dominate the cruise port area: Inner Harbour, Bastion Square, Chinatown and Butchart Gardens. 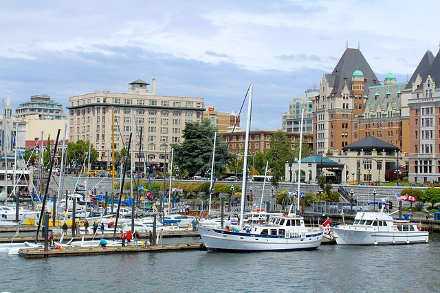 Victoria Harbour including Inner Harbour is the site of shops, restaurants and nearby access to historic buildings and architecture such as the Royal British Columbia Museum. It is a little more than one mile northeast of the cruise ship docks. Bastion Square is in the heart of downtown and next to Inner Harbour. The ceremonial entry arch at View and Government Streets is the welcome point for the original site of old Fort Victoria. The square looks out on the Inner Harbour and offers cafes, pubs and restaurants. During the summer, it has active outdoor patios and an arts and crafts market. Chinatown to the north of Bastion Square is the the oldest community of its kind in Canada and known for the "Gates of Harmonious Interest". Only the most energetic walkers from the cruise docks can reach it on foot. Most other visitors may want to get there by excursion bus. Other city highlights include the majestic Parliament Buildings, Empress Hotel and Beacon Hill Park. Even people who don’t normally visit gardens may find themselves impressed with Butchart Gardens. More than 100 years ago, the Butchart family turned a barren rock quarry into what is now one of the world’s most famous public gardens. Themed gardens, fountains, footpaths and other features cover more than 55 acres. The gardens are a 35-minute drive north of the cruise docks. They often are included in Victoria city tours from excursion companies. Admission for just the gardens is $25 plus transportation. One city tour package including the gardens was $140 for adults, so a tour that includes everything is a convenient choice. Besides plenty of excursion buses, cruise visitors at Ogden Point will have transportation options including taxis, rental cars, bicycles and public buses. Public buses stop at the Ogden Point Sundial, which is a quick walk east of the docks. Fares and schedules are available at bctransit.com. Energetic walkers can reach Inner Harbour, Bastion Square, the Royal British Columbia Museum and other nearby attractions in 15 to 20 minutes. Butchart Gardens, Victoria’s most famous attraction, is 15 miles away. The cost of a taxi is about $40 one way (plus tip), so a public bus, rental car or excursion bus is a better option for anyone on a limited budget. Victoria weather is a bit cool even during the summer months when average daytime temperatures hover in the low 70s Fahrenheit or low 20s Celsius, according to the Meteorological Service of Canada. Nighttime and early morning temperatures are chilly even during the summer when they drop into the low 50s Fahrenheit or low teens Celsius. The risk of rain is low. The average rainfall during the summer is less than two inches per month.